CBI Deputy Superintendent of Police, Devender Kumar has moved the Delhi High Court on Thursday, challenging Verma’s decision to withdraw all transfer orders passed on October 24 by former interim chief Nageswara Rao. The Central Vigilance Commission (CVC) in its probe report is said to have found no merit in the allegations of corruption levelled against Asthana in the Sterling Biotech case. NEW DELHI: The Delhi High Court on Friday will pronounce its verdict on a petition filed by CBI Special Director Rakesh Asthana challenging the FIR registered against him on October 15. In his petition, Asthana had challenged the FIR describing it as “dated” and motivated at the behest of Director Alok Verma, who was sacked by CBI. Significantly, the Central Vigilance Commission (CVC) in its probe report is said to have found no merit in the allegations of corruption levelled against Asthana in the Sterling Biotech case. 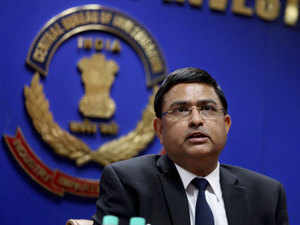 With regard to accusations, the CVC has held that the secret note mentions 23 transactions attributable to one Rakesh Asthana or RA. The total amount involved is Rs 3.92 crore. The report further adds that one transaction itself is Rs 3.88 crore. CVC found that it was a transaction between Thermax and Sterling Biotech and the transfer of money is through RTGS. The transactions were written as RA1, RA2 etc., which were interpreted as Rakesh Asthana. CBI Deputy Superintendent of Police, Devender Kumar has moved the Delhi High Court on Thursday, challenging Verma’s decision to withdraw all transfer orders passed on October 24 by former interim chief Nageswara Rao. Kumar also submitted a note on the alleged conduct of AK Bassi, Deputy Superintendent of Police (DSP), and SS Gurm, Additional SP, former investigating officers in the corruption case against Asthana. Kumar has demanded that Verma be restrained from dealing with the bribery FIR registered against him and Asthana. Kumar, arrested by the CBI in October, is currently out on bail. Kumar submitted in his petition that in the last 15 years of Bassi’s service in CBI, there have been “numerous complaints” against him accusing him of corruption, extortion and threat in different cases at different points of time. Kumar has alleged that on the basis of an “adverse input”, Bassi was transferred out of the Economic Intelligence Unit (EIU) by the Director CBI in December 2009. He has further claimed that three enquiries were initiated against Bassi when he was posted in SC-III branch in 2017-18 pertaining to misbehaviour with a senior officer, leakage of branch information and planting concocted stories to media in a case investigated by him. Kumar’s petition further claims that the name of Bassi figures in the watch list of CBI continuously from 2008 onwards except for two-three years-.“Such officers of dubious credentials are never posted in the sensitive Anti-Corruption Central units. However, Director CBI Alok Verma, for reasons best known to him, posted him in AC-III Branch in September 2018.” Kumar has further claimed that a fact-finding inquiry was ordered after it was discovered that Bassi had planted unsubstantiated information to the media in relation with the Ryan School murder case. He said while the inquiry was ordered in June 2018, the same was kept pending for more than 150 days, with no progress whatsoever, on the instructions of Verma. Likewise, Kumar has accused Gurm of having “dubious credentials and doubtful integrity”. He has alleged that Verma deliberately brought Gurm “only to further his vendetta by registering false cases and concocting evidence against own officers of CBI”. Meanwhile, Verma on Thursday ordered the transfer of five more CBI officers. DIG MK Sinha had offered to recuse himself from the AC-III unit, which is probing the corruption case against Asthana. Verma had ordered that Joint Director V Murugesan and , DIG Tarun Gauba will supervise the probe against Asthana instead of AK Sharma and MK Sinha.